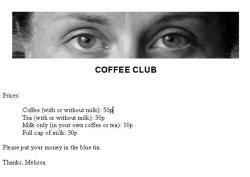 As [ax]http://www.newscientist.com/article/dn9424-big-brother-eyes-make-us-act-more-honestly.html[/ax]documented in the June 2008 edition of the New Scientist magazine, researchers experimented with the authority effect using an office tea & coffee ‘honour box’ price suggestion poster with supported by either an image of flowers, or an image of human eyes, rotated weekly. People paid 2.76 times more when the sign included the pair of eyes. And it’s simply a picture. A black and white one, too. How do you take advantage of this effect to increase the use of seat belt wearing? Like most of the behavioural anomalies we fall prey to, there’s more than one way to execute this effect to change driver behaviour: to a person with a marketing-shaped hammer we could make them a piece of film; to a person with a policy-shaped hammer we could formulate a piece of legislation. If we perform better when a picture of a stranger is watching us, what about if it’s a real person watching us? What if it’s one of our family? What if it’s one of our children? This film made by Sussex Road Safety Partnership uses the driver’s wife and child to watch over him – and indeed express their desire to save him – by being the support that holds him back during a crash. We can easily put ourselves in the driver’s seat, and imagine our close family embracing our life. We are being observed, by proxy. This film recently won the Gold World Medal at the New York Festivals International Advertising Awards (an award scheme our founder has been a judge on), beating the likes of VW, Nike, and Chanel. (And it only cost £47k). We’re sensitive to whether our actions are being observed. Knowing this is one (big) thing. Knowing how to act on it, is another (even bigger) thing.